Dalbar just recently released their 21st annual Quantitative Analysis Of Investor Behavior study which continues to show just how poorly investors perform relative to market benchmarks over time and the reasons for that underperformance. In 2014, the average equity mutual fund investor underperformed the S&P 500 by a wide margin of 8.19%. The broader market return was more than double the average equity mutual fund investor’s return. (13.69% vs. 5.50%). In 2014, the average fixed income mutual fund investor underperformed the Barclays Aggregate Bond Index by a margin of 4.81%. The broader bond market returned over five times that of the average fixed income mutual fund investor. (5.97% vs. 1.16%). increased by almost 6-months for fixed income funds after dropping by almost a year in 2013. Asset allocation fund retention rates also increased to 4.78 years, reaching their highest mark since plummeting to 3.86 years in 2008. Asset allocation funds continue to be held longer than equity funds (4.19 years) or fixed income funds (2.94 years). In 2014, the 20-year annualized S&P return was 9.85% while the 20-year annualized return for the average equity mutual fund investor was only 5.19%, a gap of 4.66%. In 8 out of 12 months, investors guessed right about the market direction the following month. Despite “guessing right” 67% of the time in 2014, the average mutual fund investor was not able to come close to beating the market based on the actual volume of buying and selling at the right times. Accordingly to the Dalbar study, the three primary causes for the chronic shortfall for both equity and fixed income investors is shown in the chart below. Notice that “fees” are not an issue. The real problem for individuals comes down to just two primary issues: a lack of capital to invest and psychology. I will not deny that “costs” are an important consideration when choosing between two specific investment options; however, the emotional mistakes made by investors over time are much more important. Let’s examine each of these issues. * 47% of households save NOTHING. * The percentage of the 16-54 population working today is lower than during the financial crisis. * The number of workers over the age of 65 in the labor force is at record levels. * Social benefits as a percentage of real disposable incomes is at record levels. * The middle 20% of the income scale has a lower net worth today than in 2008. * The NYT reports that the typical “American Household” is worth 36% less today as compared to a decade ago. * 53% of American workers earn less than $30,000 a year. You get the idea. The economic backdrop has not been one that allows for participation by the average investor in the financial markets. As I discussed in “For 90% Of Americans There Has Been No Recovery,” the Federal Reserve shows that the majority of the benefit of surging asset prices has been concentrated in the top 10% of income earners in the country, or those with capital to invest. The lack of capital to invest, for either reason listed above, has been a serious impedance to the growth of wealth over time. Narrow Framing – Making decisions about on part of the portfolio without considering the effects on the total. Anchoring – The process of remaining focused on what happened previously and not adapting to a changing market. Mental Accounting – Separating performance of investments mentally to justify success and failure. Lack of Diversification – Believing a portfolio is diversified when in fact it is a highly correlated pool of assets. Regret – Not performing a necessary action due to the regret of a previous failure. Media Response – The media has a bias to optimism to sell products from advertisers and attract view/readership. Optimism – Overly optimistic assumptions tend to lead to rather dramatic reversions when met with reality. As the markets decline, there is a slow realization that “this decline” is something more than a “buy the dip” opportunity. As losses mount, the anxiety of loss begins to mount until individuals seek to “avert further loss” by selling. As shown in the chart below, this behavioral trend runs counter-intuitive to the “buy low/sell high” investment rule. In the end, we are just human. Despite the best of our intentions, it is nearly impossible for an individual to be devoid of the emotional biases that inevitably lead to poor investment decision-making over time. This is why all great investors have strict investment disciplines that they follow to reduce the impact of human emotions. 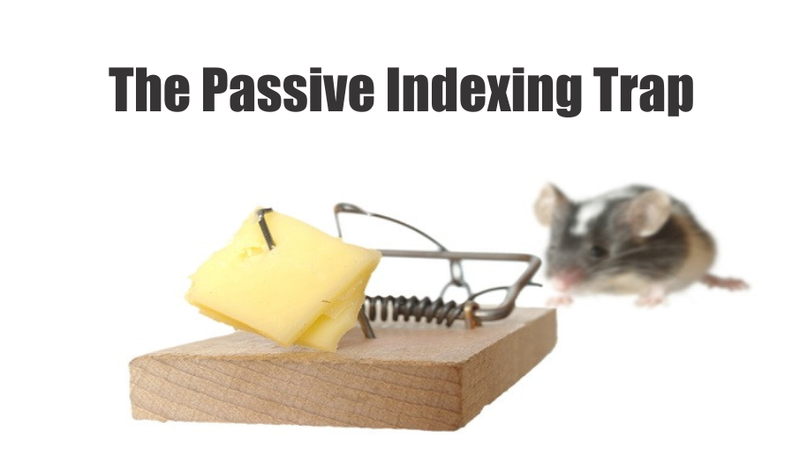 More importantly, despite studies that show that “buy and hold,” and “passive indexing” strategies, do indeed work over very long periods of time; the reality is that few will ever survive the downturns in order to see the benefits. But then again, since the majority of American’s have little or no money with which to invest, maybe a bigger problem is the lack of financial education to begin with. The second step is to react quickly. Dalbar’s data shows that the “cycle of loss” starts when the investor abandons their investments which is followed by a period of remorse as the markets recover (sells low). Of course, the investor eventually re-enters the market when their confidence is restored (buys high). Preventing this cycle requires having a plan in place beforehand. Lastly, is repetition. When markets decline, investors become fearful of total loss. Those fears are compounded by the barrage of media outlets that “fan the flames” of those fears. Advisors, need to remain congniscent of client’s emotional behaviors and substantially reduce portfolio risk during major impact events while repeatedly delivering counter-messaging to keep clients focused on long-term strategies. Messages must be delivered at the time the fear is present. As mentioned earlier, messages delivered before the investor actually experiences the event will not be effective. If the messages are too long after the fact, decisions will have been made, and actions taken that are very difficult to reverse. Messages must relate directly to the event causing the fear. Providing generic messages such as the market has its ups and downs are of little use during a time of anxiety. Messages must assure recovery. Qualified statements regarding recovery tend to fuel fear instead of calming it. Messages must present evidence that forms the basis for forecasting recovery. Credible and quotable data, analysis and historical evidence can provide an answer to the investor when the pressure mounts to “just do something”. Providing “generic media commentary” with a litany of qualifiers to specific questions will most likely fail to calm their fears. The team must have access to the resources necessary to respond quickly. There must be multiple scenarios that can be quickly adapted to a specific event when it occurs. The team must be trained to execute any of these scenarios on very short notice. The messaging for each scenario must be pre-approved and associated with the conditions under which it will be used. Each audience for the communication and the media to be used should be identified and made accessible. The team must be fast moving to intercept the build-up of fear. Both active and passive strategies are required. Active, to reach out to the required audiences and passive such as having a hot line, chat room or inquiry facility. The reality is that the majority of advisors are ill-prepared for an impact event to occur. This is particularly the case in late-stage bull market cycles where complacency runs high. This complacency can be seen in the shift from active portfolio management strategies to passive indexing which is a hall-mark sign of a late-stage bull market. When the impact event occurs, the calls to 1-800-ROBOADVISOR for calming messages and a plan to avoid major losses of capital will go unanswered. Advisors who are prepared to handle those responses, provide clear messaging and an action plan for both conserving investment capital and eventual recovery will find success in obtaining new clients.